Lake Louise is just under one hour away from the snowmbile base in Golden, just west of Yoho National Park. The snowmobile company we work with is the closest snowmobile operation to Lake Louise and is a great adventure for all the family. 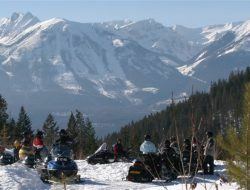 We have other tours such as the High Power Private snowmobile tour and for more experienced riders - the Extreme Tour! Please contact us direct for more details or to book. The video below is just a snapshot of what to expect on this snowmobile tour. There is no pressure to go fast or slow making this Lake Louise snowmobile tour very family-friendly.